The Connecticut Commission on Community Service is responsible for ensuring that its programs and affiliated host sites are in compliance with the obligations set forth in their grant agreements as well as all applicable state and federal regulations. All National Service programs face challenges as they administer their AmeriCorps programs. The Connecticut Commission is committed to assessing those challenges and working with grantees to find adequate technical assistance to meet their needs. To that end, the Commission has developed a monitoring strategy that enhances opportunities for guidance and intervention. Persons Responsible – assignment of responsibility for system components to appropriate program staff. The required systems listed above must meet at minimum the standards illustrated in the Risk-Based Monitoring Tool Part I – Systems. Additional detail is welcome, and additional systems beyond those contained on this list may be created and maintained by programs at program discretion, but are not required for review by CCCS Program Officer. Compliance Site Visits will be scheduled by your CCCS Program Officer. Should the date determined present an unresolvable conflict, please contact your CCCS Program Officer well in advance to reschedule. Review the Risk-Based Monitoring Tool Part 1 – Systems and Part II - Compliance provided by your CCCS Program Officer. Ensure that all systems (above) have been updated as requested prior to your scheduled site visit date. Prepare all related documentation for components of the Risk-Based Monitoring Tool Part II - Compliance for the scheduled visit date. Ensure that all required parties (members, appropriate program staff, member supervisors/ host site supervisors) will be available for the scheduled visit date. Note: This should typically be verified with your CCCS Program Officer at least one to two weeks prior to the visit. Verify that member timesheets are properly completed, signed and up-to-date. Ensure that there is a private meeting space available for CCCS staff to meet with program staff, host site staff and members. A table with chairs should also be available in the space. Ensure that CCCS staff will have access to all necessary files (see Risk-Based Monitoring Tool Part II - Compliance). Provide any additional information requested by CCCS staff. After the visit, the AmeriCorps Program Director will receive feedback in a site visit report. Your CCCS Program Officer will provide this to the AmeriCorps Program Director and the designated Executive Director of the program’s legal applicant. Note: It is important to ensure that your program keeps all requested program/legal applicant contact information up-to-date with the Commission. Program Directors must submit contact information to the CCCS Program Officer in writing (email is acceptable). Program Directors must respond to any findings indicated in the site visit report with a corrective action plan and provide requested documentation by the date specified in the report. If it is determined that your program has significant compliance issues or requests additional assistance, your CCCS Program Officer may schedule additional site visits. While site visits can provide a first-hand view of program operations, desk-based monitoring is an indirect, yet invaluable view of your program’s management. Using the My AmeriCorps Portal in eGrants the Commission will review each program and service site’s progress on member recruitment and retention and conduct member status inquiries (i.e. enrollment, exit, suspension). And, using the OnCorps Reporting Portal, the Commission will accept systems document submissions from programs and monitor member documentation progress. Findings that are not in compliance with AmeriCorps Regulations and Terms & Conditions for AmeriCorps State and National Grants or CCCS policies and requirements will be documented in a Compliance Citation (see Compliance Citations Below). TIP: Set a reminder in your calendar to review member status in My AmeriCorps on a monthly basis to ensure that your recruitment, enrollment, and member statuses are compliant. Martin Luther King, Jr. Day of Service: All AmeriCorps*Connecticut programs must implement a service project in celebration of Martin Luther King, Jr. Day. Programs nationwide celebrate Martin Luther King, Jr., Day as a "day on, not a day off" by engaging youth, neighbors, partners, and businesses in service projects that promote Dr. King's legacy of service and justice. Resources are provided by CNCS to assist programs in planning an effective MLK Day service project. The designed service project must include all AmeriCorps staff and members. AmeriCorps*Connecticut programs may collaborate with each other and with community partners. AmeriCorps Week: All AmeriCorps*Connecticut programs must refer to their Grantee Agreement for specific instructions regarding any Commission-defined requirements for program participation in AmeriCorps Week, dates for which are set by CNCS to occur annually during the second full week in March from Sunday to Saturday. AmeriCorps Week is set aside to highlight the impact AmeriCorps members have all over the country each and every day; in addition to meeting any Grantee Agreement requirements, AmeriCorps*Connecticut programs are strongly encouraged to participate in promoting awareness in their communities and at large about their AmeriCorps impact via social media and participation in events and activities visible in the community. Descriptions of all service days and commemorations are available in the AmeriCorps Events section. TIP: January comes quickly when you’re in the midst of building an AmeriCorps program’s momentum! Begin your Martin Luther King, Jr. Day of Service planning early, finding or developing creative ways for your staff and your members to mark this important day with meaningful national service activity. Don’t let January catch you by surprise! Performance measurement is the systematic, ongoing tracking of your program’s outputs and outcomes. Performance measures are used to gauge your program’s progress on addressing its defined community need. Program staff must have detailed and accurate procedures for tracking performance measures. Program Directors, key staff and, where appropriate, AmeriCorps members should be informed about the program’s performance measures and how that data is assessed and maintained. Performance Measures will be monitored by your CCCS Program Officer on a quarterly basis (see below). The Corporation has developed a comprehensive resource center that describes all National measures, in detail, by priority area. You may review these measures by visiting the CNCS website: http://www.nationalservice.gov/resources/performance-measurement. If you are considering adjusting your program performance measures, mid-year, please consult with your CCCS Program Officer as early as possible. All requests for Performance Measure amendments must be received by February 28th annually. (See Table 1: Program Amendment Reporting). The Connecticut Commission collects Program Progress Reports on a quarterly basis; these reports are submitted by programs electronically using the OnCorps Reporting Portal; each program will be provided with a link and login instructions to access the portal at the start of the program year. As detailed in your program grant agreement, progress reports are due on or before the 15th day of the month following the end of the quarter: January 15, April 15, July 15 and October 15. NOTE: It is expected that all progress and financial reports due to the Commission will be received by their respective due dates. Program directors should coordinate with fiscal and other relevant program staff to ensure that all deadlines are met. Late submissions may lead to delayed or withheld reimbursements. Compliance Citations will be issued to programs that are found out of compliance with CNCS or CCCS requirements at any point in the program year. Compliance citations will be issued by the CCCS Program Officer and maintained in the program’s file. Program Directors are responsible for disseminating information contained within a Compliance Citation to the appropriate program staff. They are also responsible for ensuring that any required corrective action and reporting is completed as requested. An accumulation of compliance citations may lead to withheld, delayed, or suspended grant payment requests. These citations will also be considered during evaluation of continuation and re-compete funding requests. 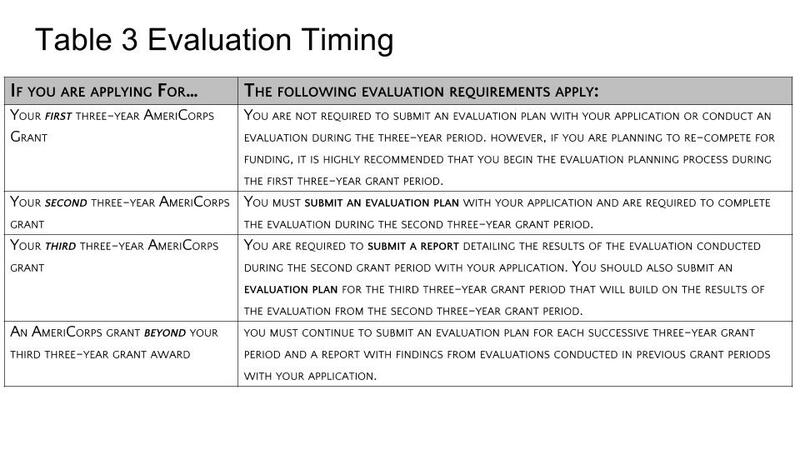 Table 3 Evaluation Timing for a description of what components of the evaluation process apply to your program based on its grantee status. Re-competing and continuation programs must submit a summary of their evaluation efforts/plans to date or a copy of their evaluation results with their annual application for funding. Evaluations may be performed internally or independently, depending on the amount of CNCS grant funds received by your program (45 CFR§2522.700-740). AmeriCorps regulations require AmeriCorps*State and National grantees receiving more than $750,000 of CNCS grant funds to conduct an independent evaluation. Independent evaluations must use an external evaluator with no formal or personal relationship to the organization. 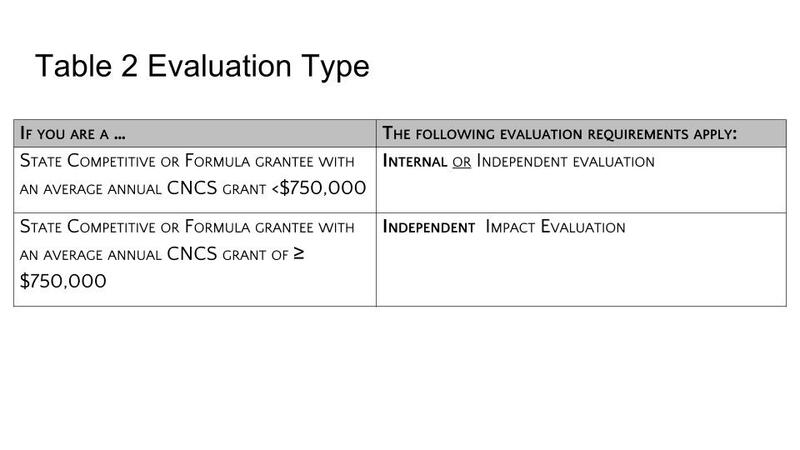 AmeriCorps*Connecticut Formula and Competitive receiving less than $750,000 of CNCS grant funds can submit an internal evaluation (see Table 2 Evaluation Type). The evaluation process is a helpful tool in assessing and developing improvements to your program that may enhance future funding applications. There are different types of evaluation designs that can be used, depending upon what you wish to assess about your program. For more detailed information about evaluation designs and planning, please see http://www.nationalservice.gov/resources/evaluation.